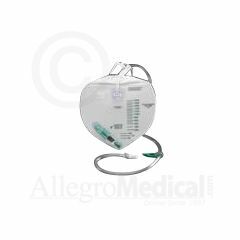 Bedside Drainage Bag features anti-reflux valve, vented drip chamber, urine sample port on catheter connector tubing. Standard product . Standard product . clamp opens spontaneously. tubing too short. needs more secure clamp. This is a standard product that is easy to find. If they measured the length of the tubing from the top of the handle instead of bag insertion that would work much better 6 inches of tubing is lost between the insertion and handle. The metal drain clamp is a disaster. It pops open too easily and if you store your bag in an under seat bag may find yourself creating a puddle in public because the clamp popped open. A huge embarrassment. That metal drain clamp is the drain device I most hate to see in nearly 30 years of drain bag usage. I have had more accidental puddles with that clamp that with any other form of drain. After radiation caused urinary problems, having to use catheters and night bags has made life easier for me. Use at night when I sleep and use a leg bag during day. Pin it to sheets and unpin if I need to get up for some reason. Product is very durable and flexible. Easy to pack for trips. I have found that the tube that comes out of the bag to the drain clip comes loose from the bag, have had that happen 3 times now. Causes big mess try to keep bag sitting in plastic container but can't do that ALL the time.There should be glue to hold it in place, much safer. I replace the drainage tube and clip with a 5 to 6" piece of rubber (latex) tubing and catheter plug. I use these for my leg bag too w/a 10" piece of tubing. The tube that I've found easiest to use measures 1/2" inside diameter with a 1/16" wall (tubes with the thicker wall are hard to put on). This is easier to empty the bag and eliminates the metal clamp cutting into the green tube or accidentally opening. The latex tubing was hard to find, though, and was sold by the foot. I bought a box of 100-ft. at a small, local medical supply store. I buy Allegro's #561620 plug & cap set so I can protect the top of the drainage bags. I hope this helps! if bed does not have anything to hook on foley bag, what can I use? We do not use the hook feature on the bag. At night we hang the bag on the rim of a bucket.